The Ewing Green Team is delighted to report that we were just awarded a $20,000 Sustainable Jersey grant funded by the PSEG Foundation. Four $20,000 grants, eight $10,000 grants and twenty $2,000 grants were distributed to fund a variety of projects in communities around the state. Our grant was for protecting the community tree cover. Ewing’s existing natural resources, including our tree cover, and the need to preserve these resources were key priorities agreed to by Township residents during the Ewing Green Team’s 2014 Community Visioning Project. Residents agreed that preserving a community’s tree canopy, both forest stands and street trees, is extremely important in combating climate change, but also in creating a community that is aesthetically appealing and that provides opportunities for residents to be closer to nature. However, events of the past several years and upcoming threats to the tree canopy make protecting our tree canopy in Ewing a challenge. In 2012 Ewing suffered substantial losses to its tree canopy in its public parks as a result of a microburst in July, followed by Hurricane Sandy in October. 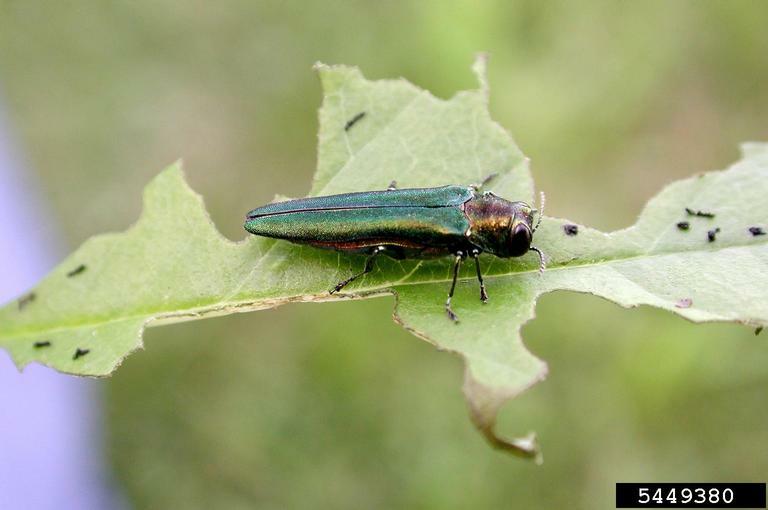 Since then, the Emerald Ash Borer (EAB), identified by a Rapid Ash Survey completed by the Rutgers Urban Forestry Program and NJ State Forestry Services in the summer of 2015, confirmed the presence of this destructive invasive insect in Ewing. The Survey identified more than 890 infected ash trees on public property. To protect the integrity of the tree canopy, and to increase Ewing’s tree cover overall, the township must begin a management program to replace the trees with non-invasive and native trees. Our grant, Partnering for the Restoration of the Community Forest: The 3P Plan, Partnerships-Plan-Planting, will fund development of partnerships (the County, Rutgers, PSE&G, DEP, and however many others we can find) to manage the spread and removals of trees infected with the Emerald Ash Borer on Ewing municipal lands. It also include partial replacement of Ash trees (100) lost to the EAB. And, it will include community outreach and education. We will be working with NJ State Certified Tree Expert, Bill Brash to manage the grant. In addition, Ewing Twp. has also has negotiated with the Delaware River Joint Toll Bridge Commission for replacement of trees lost from the Scudder Falls Bridge Replacement project under the No Net Loss Program(NNL). The Twp. has been told that there will be funding for planting approximately 600 trees on municipal lands. These will probably be planted in the fall. We also hope to obtain grant funds to inventory Ewing parks for Ash tree locations and help the Twp. to determine locations for the 600+ NNL trees. We are well on our way to accomplishing a number of the goals laid out by our Visioning, from tree plantings to restore our tree canopy, to sponsoring of educational workshops for the public, and more. So, it’s a little good news for our tree canopy! Thank you, Sustainable Jersey and PSE&G Foundation! Previous Previous post: Calling All Artists in Ewing Township! The Ewing Green Team and Arts Commission Are Looking for You! Now if we could get all the landscaping companies and private citizens to stop over mulching their trees we would secure the trees for future generations. As it is, over mulching is creating weakened trees at the base of the trunks and such trees will fall ever more quickly in storms. Absolutely! We need an educational campaign to discourage use of those nasty mulch volcanoes in town. It’s great to see more groups working towards environmentally sound practices. I hope that everything worked out!